In June, my 21 year old daughter, Hazel and I took a huge leap of faith and flew to Mongolia. 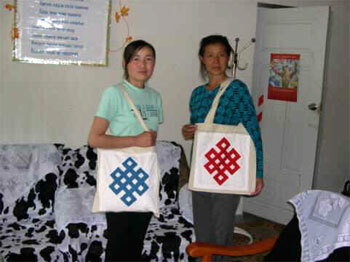 Prior to leaving, we raised funds and solicited materials for the soon to be opened Mongolian Quilting Center. Viking sent five small sewing machines, Prym-Dritz supplied us with rotary cutters, mats, metric rulers, needles, pins and quilting hoop, Coats & Clark gave us thread, David Textiles and many quilting friends gave us fabric and the Bainbridge Island Rotary Club donated $500 for us to ship these quilting supplies to Mongolia. Upon arrival, Selenge Tserendash, the founder of the New Way Life NGO, was there to meet us and welcomed us warmly. English is her fourth language (after Mongolian, Russian and Japanese), and most of the Mongolians we met knew no English. 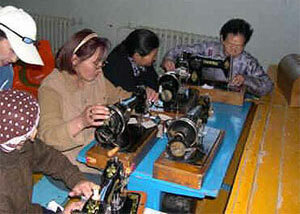 Our main goals were to introduce quilting in presentations, promote the New Way Life Mongolian Quilting Center, help the women with some quilting experience improve their skills so that they could teach the beginners, and to teach the women to make marketable patchwork or quilted items. 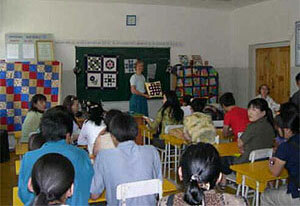 For two weeks, Hazel, and I were based in the capital city of Ulaanbaatar, giving presentations to groups of low income and unemployed women, and introducing them to simple piecing techniques such as strip pieced 4-patches and fast pieced half-square triangles. This was very successful despite the challenges presented by language, intermittent electricity, poor roads (or lack of them), and Mongolian time keeping! Selenge, translated and assisted with the presentations. She invited the women to the newly opened Center to sign up for classes and learn more. The Mongolian TV news channel featured a quilting presentation, and we recorded a show demonstrating making a tote bag for TV Channel 25, so our work and the Quilting Center received extensive publicity. We were also invited to the Parliament Building by Communist Member of Parliament Nansaljaviin Gerelsuren, who thanked us for coming to Mongolia to help needy women, and expressed her appreciation to those who donated equipment and helped with fundraising. Our afternoons were spent at the New Way Life Mongolian Quilting Center (sponsored by the Japanese Chapter of UNIFEM), where women visited and we taught basic quilting skills. I chose to teach techniques that utilized the materials that they have available and to enhance their skills. Large sacks of industrial scraps from cotton shirting factories are very cheap. Most of the fabric scraps are small, but some larger pieces surfaced and were saved to piece into quilt backs and borders. We taught 4-Patches, half-square triangles, Log Cabins, Crazy Patchwork, English paper-pieced hexagons, and hand piecing and appliqué, as well as basic skills in quilt assembly, hand and machine quilting, and sewing machine maintenance. I wanted to encourage the women to use Mongolian patterns, so I taught them how to piece the Ölzii, a traditional Mongolian symbol, into a quilt block. We made tote bags out of cheap and readily available ger (Mongolian yurt) fabric and added the Ölzii block (see picture below). These are attractive and marketable. The Ölzii symbol is prevalent throughout Mongolia painted on the doors of gers and on metal gates. It is thought to bring long life and prosperity, and to drive away wild beasts and evil spirits. In Tibetan Buddhism, which is practiced in Mongolia, this never-ending knot symbolizes the universe and the unending cycles of life and death. After our time in the city, we spent 11 days traveling in the beautiful Mongolian countryside, through Central Mongolia and up north to Lake Hovsgol, with Selenge as our guide. In September 2004, Selenge had to close the Center due to rising costs and funding problems (Japanese funds were diverted to help earthquake victims). A small group of women continued making bags, aprons, and tablemats to sell and these have proved popular. In December, donations from a couple of generous individuals and funds from St. Barnabas Episcopal Church Christian Outreach Commission amounted to $4,000, which we sent to Mongolia. 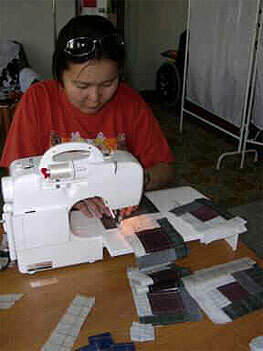 Selenge was able to re-open the Mongolian Quilting Center in a small basement apartment. Two women were employed to teach and make items to sell to help sustain the Center. They also offered childcare for women who came to take quilting classes and use the facilities.